A great, big, fluffy intruder slunk his way onto our roof tonight. He was really friendly and very, very fluffy (much to Evie’s delight). Big, fluffy intruder cat is now cowering in our next door neighbours garden and Arnie is back to snoozing on Evie’s bed. 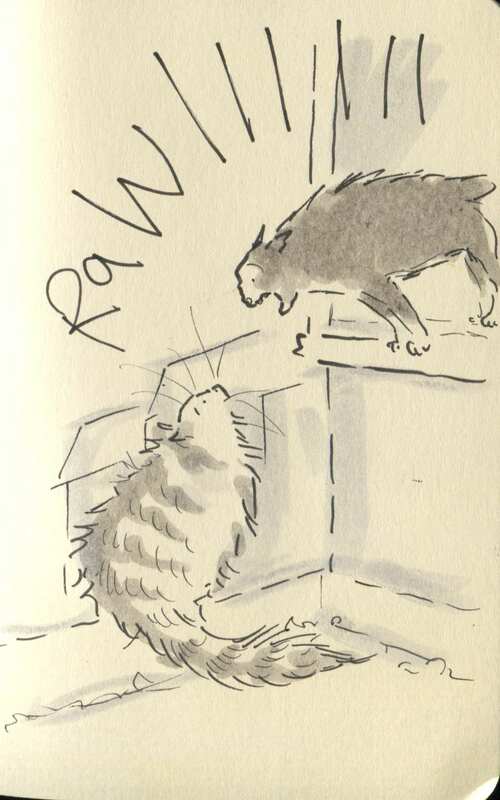 Posted on September 15, 2014, in Uncategorized and tagged cats, Children, Doodlemum, Drawing, Family, Humour, Illustration, Life, Pen and Ink, Sketchbook. Bookmark the permalink. 7 Comments. Big fluffy intruder looks like my cat, Spencer; if I didn’t live so far away from you, I would guess it was him! Oh dear! Dueling cats, not such fun! You forgot you had Arnie?! The kids had better watch out, or you’ll be letting stray humans in, too! This is pretty much our house, every night, but with our two cats who have lived together for 4 years. Well illustrated.